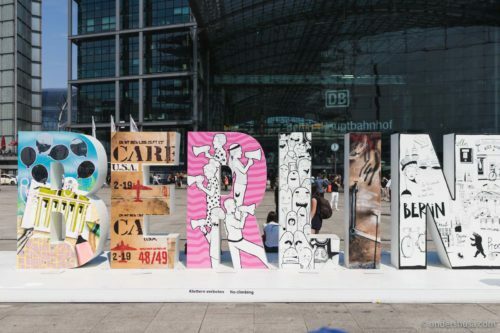 Berlin is the central city of Germany and the hipster capital of Europe. Due to its history and location, it has become a melting pot of cuisines from all over the world. I have gathered all my Berlin recommendations in this foodie map, a lot of which were suggested by Berlin’s top food writer Per Meurling. Check out his blog Berlin Food Stories. You’ll find coffee-, wine- and cocktail bars, fast food, and fine dining restaurants. Navigate the map easily either by scrolling through the list on the right or by clicking the points on the map. Places are listed in geographical order. The Nextflix-featured chef Tim Raue runs the eponymous two-Michelin-starred restaurant, currently ranked no. 37 on the World's 50 Best restaurants list. Raue was trained in classical French institutions, but fell in love with Asian cuisine. His cooking strives towards technical perfection, mixing German ingredients with the oriental food culture – always featuring bold flavors and a touch of luxury. Nobelhart & Schmutzig is a fine dining concept created by sommelier Billy Wagner, executed together with head chef Micha Schäfer. However, the duo prefers to call it a fun dining restaurant, which is, perhaps obvious from the name which translates to "Classy & Dirty." Highly simplistic presentations, strictly local ingredients, and very few elements on the plate, are key features. Cameras and photos are not allowed at this counter seat establishment, so instead, focus on the flavors and talk to your dining companion(s)! Bonanza Coffee Roasters is a not-so-secret coffee oasis hidden in a courtyard in the district of Kreuzberg. This is their second location, after the success of Bonanza Coffee Heroes in Prenzlauer Berg. Their roasting profile is light, their focus is on flavor and high quality, and their moral standpoint is that farmers should be paid a fair price. It doesn't hurt that they have built an open and relaxing space to enjoy your ethical and excellent espresso. In an old pharmacy on Oranienplatz lies restaurant ORA. Apparently, the name was chosen from the three remaining neon letters on the wall still functioning. They don't make pharmacies like this anymore. Wooden walls covered in little drawers that used to store medicine. Teal-colored leather couches and green plants give it a fresh new hipster look. From a vegetable-focused menu, I enjoyed a wonderful zucchini tart. Imren Grill, according to Per Meurling, is the best döner kebab in Berlin. Having heard him speak with great passion and knowledge about different schools of döner, I take his word for it. The Turkish food staple should be freshly made and served fast! In the words of Mr. Meurling: "A true Berliner would never line up for a döner. Only tourists do that." Enjoy with Ayran on the side – Turkish salted yogurt. Jaja is a tiny natural wine bar and eatery, like something straight out of Paris, situated in the district of Neukölln in Berlin. The walls are covered in wine bottles with lovely labels, most of them from France, including some of my favorite producers. Small plates of are meant to be shared, with everything proudly made in-house from local and organic ingredients. The Five Elephant coffee shop in Kreuzberg is almost more famous for their cheesecake than their brews. In fact, it is the only place in the world where I have tasted a cheesecake that can measure up to the one my mother makes. It also happens to be my favorite café in Berlin. Along the Landwehrkanal in Friedrichshain-Kreuzberg, you find Wagner. It may be a cocktail bistro, but I see it as a natural wine bar and eatery. The food is simple and good, but not reason alone to go here. I mostly remember the juicy and colorful beverages that kept filling up my glass, as per the sommelier's recommendation. Located in an old public toilet, right underneath the railway bridge at Schlesisches Tor train station, you find the original Burgermeister. As if trapped on a traffic island in the crossroads of Oberbaumstraße and Schlesische Straße in busy Kreuzberg. Prepare to line up if you want a taste of the famous burger. The length of the queue depends on the time of the day, but continues long past midnight (the place is open until 3 AM). Is it worth the wait? Short answer: Yes! There are probably no better options for late-night food in Berlin, at least. The hip hotel Michelberger in the Friedrichshain district has a restaurant in the backyard with the same name that attracts both locals and hotel guests. At Michelberger restaurant, the wine is mostly natural and the contemporary food is fresh and heavily vegetable-based. Ingredients are organic and locally sourced from farmers in the countryside surrounding Berlin. Blend in with the cool crowd and enjoy the vibe. Zur Letzten Instanz is Berlin's oldest restaurant (from 1621) and the place you want to go to experience truly traditional German cuisine. Despite its fame, it's not a tourist trap. In the summertime, you can sit outside in the restaurant's courtyard. From the menu, you want Königsberger Klopse (meatballs) and the Eisbein (boiled ham hock) with sauerkraut. Check into the Weinmeister in the Mitte district if you want to experience a different boutique hotel in Berlin. Enter through the black wall, decorated with John Travolta and Samuel L. Jackson taking a photo with a selfie stick as if a modern scene from Pulp Fiction. Each room is uniquely designed with a personal touch. I stayed in René Turrek which featured a spectacular color-changing bathtub. Cordobar was a natural wine bar and eatery in Mitte with a Bib Gourmand in the Michelin Guide at the time of my visit. However, it has recently been rebranded to Cordo – a fine dining restaurant with a six- and nine-course tasting menu. The vast wine list is dominated by Austrian producers and the by-the-glass offering included favorites of mine like Gut Oggau and Christian Tschida. Unfortunately, I've never had the pleasure of eating here, so I can't comment on the food. Mr. Susan is a relatively new and slightly different cocktail bar by the American Korean Susan Choi and her husband Stefan Endres. Beautifully located on the corner of Krausnickstraße and Oranienburger Straße, overlooking Monbijoupark Park with a view towards the Spree river. I visited them shortly after the opening night, and was served some of the strangest and most complex cocktails I've tasted. Tomato water and sesame. Savory tasting and clear colored. Mogg is the Berlin equivalent to the New York institution Katz's Delicatessen. Located in a red brick building, a former Jewish girl's school, the restaurant interior has a canteen vibe over it. Although their sandwiches can't quite measure up to the top N.Y. deli ( I found it a bit on the dry side), they make a decent pastrami sandwich on rye. Get the Reuben and order a brûlée chicken liver mousse on the side. The Barn café and roastery is, perhaps, the most famous of the Berlin hipster coffee shops. An institution for the specialty craft coffee, where locals and tourists alike gather to drink a lighter and more flavorful brew. At the Barn, they work closely with each individual coffee farmer, sourcing for quality, cleanliness, sustainability, and traceability. Kauf Dich Glücklich is a combined ice cream shop and fashion boutique on Oderberger Straße. With a name that translates to "Buy Yourself Happiness," I guess it's officially true: You can't buy happiness, but you can buy ice cream, and that's kind of the same thing. Try some of the more exotic flavors. Since 2006, Bonanza Coffee Heroes have been a part of Berlin's café scene and the specialty coffee industry. Also known as the third wave of coffee, this coffee shop builds on a new set of ideas about coffee roasting and brewing. Focused on making coffee an artisanal product rather than a commodity – a trend that quickly spread among the younger generation in the coffee industry since the 1990s. Prenzlauer Berg is the original location and still a cool spot on Oderberger Straße. Ernst is the most exclusive and difficult-to-book restaurant in Berlin at the moment. A counter-dining experience that seats only 10 people every night and serves between 35 and 40 small bites at a rapid pace. Produce-driven gets a new meaning as the young Canadian chef Dylan Watson-Brawn and his team aim to serve only the freshest, most high-quality ingredients that they source from select farmers they work closely with. Not hyperlocal at all – just the best of what's in season.